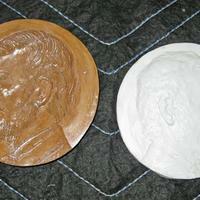 A series of Abraham Lincoln medallions in plaster, and a rubber mold. Three of the plaster medallions have no text. The rubber mold and the positive made from it have the words "Abraham Lincoln" on them.